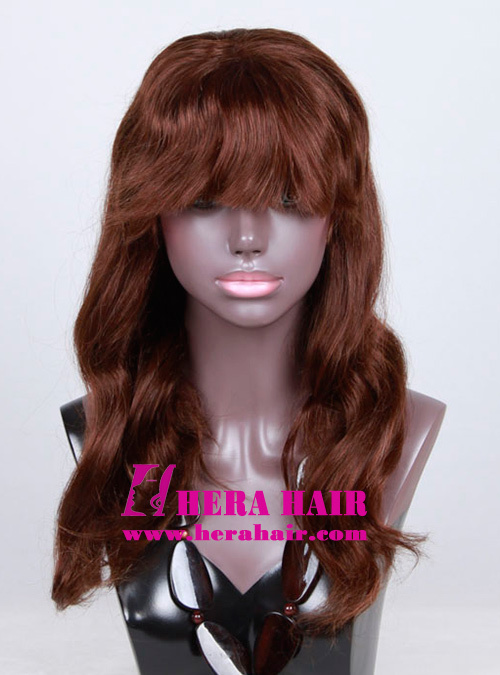 This celebrity lace wig is Hera custom 20 inches wavy texture dark brown Indian virgin hair celebrity full lace wig with bang, which bang lace wig will make you look younger. 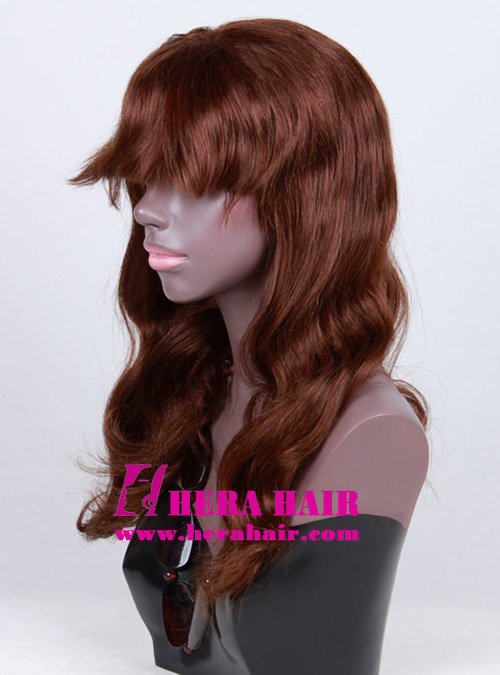 Hera is the best professional custom celebrity lace wigs manufacturer in Qingdao, China. Normally speaking, Hera don't supply stock celebrity full lace wig. If you have favorite celebrity style, you need to do custm celebrity full lace wig. First, Hera could supply full series of hair materials, such as Indian virgin hair, Chinese virgin hair, Malaysian virgin hair, Brazilian virgin hair, European virgin hair and Hera start to supply top quality European virgin hair for custom full lace wigs from December 2014, which we only top quality European virgin hair for Jewish women wigs before, so you could choose the suitable hair material according to your bargin. Second, according to our experience, stock full lace wigs may has stocked long time, especial for the not sellable length and color wigs, so the custom celebrity lace wigs could have the best health hair status after all hair has life time. Third, stock lace wigs cap size is fixed but the people has different head measurement, so the custom celebrity lace wigs could be perfect for you. If you want to custom celebrity full lace wig, you could confirm the wig's hair length, hair material, hair color, wig style and the measurement then we can offer you. About the wig style and hair color, you could choose the right style and color from our website, you also can send your favorite celebrity's picture to us then we could give you some advices according to the picture and your prefer. 1. The wig on the picture don't look perfect because they are the orignal status. So after you get the wig, you'd better take the wig to hair salon and let your hair stylist to make the perfect look according to your face. 2. About custom lace wig order, we only accept Western Union payment and don't accept return or exchange, but don't worry, if we confirmed the every details about the order, you will get the perfect custom lace wig because Hera are professional, oh no, the best professionl in China.